CORTINA D'AMPEZZO, Italy (AP) — Olympic downhill champion Sofia Goggia is planning to return from injury this month but remains in doubt for the upcoming world championships. COLORADO SPRINGS, Colo. (AP) — The U.S. Olympic team has been invited to the White House for a visit April 27, leaving the 244 members about four weeks to decide if they'll attend. Four members from the U.S. team — Gus Kenworthy, Adam Rippon, Nathan Chen and Lindsey Vonn — have said they would not go if invited. Visits to the White House are a decades-old tradition, though there have been notable absences over the years regardless of who's in office. PYEONGCHANG, SOUTH KOREA The Norwegians ran away with the medal count. The Russians got busted for doping, again. The home team, South Korea, won hearts. And the Minnesotans? They just won. As the Pyeongchang Olympics close out a 17-day run Sunday, Minnesota athletes have collected three gold medals and a bronze, made all kinds of history and contributed significantly to the United States fourth-place showing in the medal standings. JEONGSEON, South Korea (AP) — Lindsey Vonn came to South Korea with the goal of taking home an Olympic medal and leaving behind something even more special. PYEONGCHANG, SOUTH KOREA – Take that, Norway. You might be running laps around everyone else in the medal count, but you can’t have all the Olympic fun. Minnesota stole some of your spotlight on Wednesday. You Betcha. In the morning, Lindsey Vonn became the oldest woman (33) to win an Olympic Alpine medal by taking bronze in the downhill. PYEONGCHANG, South Korea (AP) — Lindsey Vonn turned in a bronze-medal performance in the last Olympic downhill of her career. Russian Alina Zagitova skated a flawless "Black Swan" routine for a world-record score in the short program and a shot at gold after Friday's free dance. And Norwegian Marit Bjoergen became the most decorated Winter Olympian of all time by taking bronze in women's cross-country skiing. Here are some highlights of Day 12 from Associated Press photographers. Jeongseon, South Korea — Lindsey Vonn knew that the bronze medal she earned Wednesday came in her final Olympic downhill, the signature event of her singular career. She knew that, but she didn't have an easy time processing it. "I put my boots on and said, 'This can be my day, so let's make it,'" the newly minted gold medalist said. JEONGSEON, South Korea (AP) — Over coffee last November at Lindsey Vonn's home in Colorado, Sofia Goggia of Italy asked her friend for some advice. Vonn didn't hesitate to answer. An honest answer, and one the new Olympic downhill champion seemed to take to heart. "It probably helped her (win)," Vonn said with a wry smile. JEONGSEON, South Korea – Lindsey Vonn finished her final Olympic downhill race with a salute to the crowd. Then she blew a kiss to the sky to honor of her late grandfather. She didn’t fulfill her goal of winning a gold medal in her signature race at her final Olympics. She had to settle for making Olympic history. Vonn won a bronze medal in the women’s downhill on Wednesday to become the oldest woman (33) to win an Olympic Alpine medal at the Jeongseon Alpine Centre. 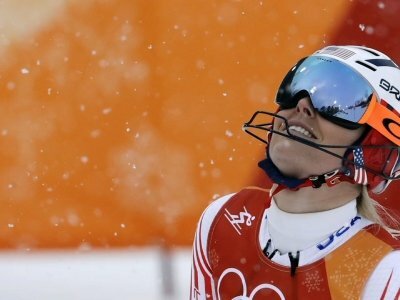 JEONGSEON, South Korea - Lindsey Vonn cast a quick glance toward the sky after finishing what was likely her final Olympic downhill run, shrugged her shoulders after seeing her time, and shook a friendly index finger at her good friend. PYEONGCHANG, South Korea (AP) — Lindsey Vonn is set to compete in her last Olympic downhill, but she says she'd rather not focus on that right now. Vonn, the downhill gold medalist at the 2010 Vancouver Olympics, is generally considered the favorite at the Pyeongchang Games. She's looked good in training runs. PYEONGCHANG, South Korea (AP) — Canadian ice dancers Tessa Virtue and Scott Moir floated across the ice in perfect harmony to break their own record for a short program. American Lindsey Vonn was third-fastest on the second day of Olympic downhill training. And the U.S. women's hockey team made it back to the Olympic gold medal game after routing Finland 5-0 in the semifinal. Here are some highlights of Day 10 from Associated Press photographers. JEONGSEON, South Korea (AP) — Lindsey Vonn is not planning to change her mind or stop saying what she thinks, no matter what attacks folks might send her way via social media. JEONGSEON, South Korea (AP) — Lindsey Vonn's first Olympic race in eight years included one obvious, late mistake that she was sure cost her a medal — maybe even the gold. Jeongseon, South Korea — Ester Ledecka of the Czech Republic made a stunning run from back in the pack to take the Olympic super-G title on Saturday, with a mistake costing Lindsey Vonn a spot on the podium. Ledecka, the 26th racer to take the course, blazed through the course in a time of 1 minute, 21.11 seconds. Defending champion Anna Veith of Austria earned the silver, finishing 0.01 seconds back, and Tina Weirather of Liechtenstein captured bronze. PYEONGCHANG, South Korea (AP) — Lindsey Vonn's first race at the Pyeongchang Olympics is the latest to be delayed because of strong winds. The start for the women's super-G has been pushed back by an hour to Saturday at noon local time (Friday at 10 p.m. ET). PYEONGCHANG, SOUTH KOREA Lindsey Vonn arrived at her pre-Olympic news conference wearing gloves, which seemed a little odd since she was inside a warm auditorium, but then again, Vonn isnt willing to leave anything to chance. Dont want to get sick, she explained. Just being safe. I wore them on the plane over here as well. Just trying to stay healthy. PYEONGCHANG, South Korea (AP) — Say the name Lindsey Vonn, and skiing comes to mind. Mike Eruzione, a miracle. Shaun White, tricks and flips. Michelle Kwan, jumps and grace. They are faces of winter sport in the United States. Q: Who are the Americans to watch? Many Olympic veterans return, but there also are plenty of new faces on Team USA. GARMISCH-PARTENKIRCHEN, Germany (AP) — Lindsey Vonn won her second World Cup downhill of the weekend on Sunday in a perfect dress rehearsal for the Pyeongchang Olympics. GARMISCH-PARTENKIRCHEN, Germany (AP) — Lindsey Vonn edged Sofia Goggia in a foretaste of the Pyeongchang Olympic downhill on Saturday, raising her career total to 80 World Cup victories. The American standout beat Goggia by two hundredths of a second as their ongoing rivalry in Alpine skiing's fastest discipline continued. "It's a big number," Vonn said of her 80 wins, just six short of the all-time record set by Swedish great Ingemar Stenmark in the 1980s.